The 60 Minutes interview of actor Dennis Quaid is set to air this coming Sunday, March 16th. In the interview, Quaid gives a detailed account of the medical negligence that nearly killed his newborn twins. Here is a clip. "When you can measure what you are speaking about, and express it in numbers, you know something about it." Tort filings have steadily declined since 1990. The overall median damage award in tort jury trials is declining. Only 2 percent of seriously injured Americans ever file a lawsuit. 22 percent of “tort costs” that PRI cites are insurance industry “administrative expenses,” like salaries of executives, rent and utilities for insurance company headquarters, and advertising. Seems our friends at the American Tort Reform Association are not just obsessed with fire, brimstone, and hellholes. 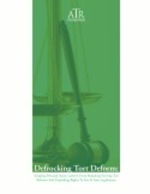 Now they want to talk about "defrocking" tort deform. That ATRA must be one devout organization! We also found it interesting that their recent 18-page report has a whopping 4 footnotes, in 3 of which they cite themselves or their own lawyer. 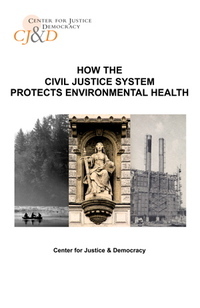 Compare that to the Center for Justice & Democracy’s most recent 19-page report, with 124 footnotes, largely academic journals, legislation and news articles. Need we say more? Like the “Toys for Tots” charitable drive to provide gifts to children during the holiday season, it appears big pharmaceutical companies have adapted a similar program. Except it doesn’t involve toys for children, but rather, for doctors. We’ll call it “Toys for Docs.” And we mean big “grown-up” toys, like free meals, trips, paid consulting contracts and even super bowl tickets. And it’s year-round. No wonder. As this article points out, “The number of prescriptions for a drug rises in direct proportion to the handouts a physician accepts from the manufacturer of that drug.” Meanwhile, both drug companies and doctors are going around the country trying to make sure that if patients are made sick or injured by these drugs, they can’t do anything about it. That’s some sweet deal for a drug, oops I mean toy, pusher! WAMC Reports on "Patient Safety Express"
Great story by David Lucas of WAMC about our journey to Albany to protect the rights of patients and stop taxpayer subsidized medical malpractice. Check out the full audio clip below. Thanks to Ted Frank at the American Enterprise Institute, for telling us how tough it is out there for Big Insurance! I’m sure you will all just love to read the memo that was leaked to us by our friends in the insurance industry! It’s all about that simply horrible Consumer Federation of America report that Ted finds so very unfair. According to a recent report released by the Consumer Federation of America, in the last four years, the property/casualty insurance industry made over $253 billion in profit and overcharged every household in America about $870. (CFA's press release, Full report) To that I say, break out the bubbly and let’s party! In all seriousness though, there are some people who believe this is further evidence of big corporations fattening their bankrolls off the backs of hardworking, middleclass folks—an interesting conspiracy theory. The fact is that for too long, we’re the ones barely scraping by. We’re the ones on the political fringe with little representation in government. Unlike consumer groups - massive and entrenched institutions with thousands of politicians on their payroll - we’ve never had a say in our government. Now with these kinds of soaring profits, the insurance industry can finally have some serious pull in Washington. Here’s why that’s so important. Everyone, it seems, is jumping on the “change” bandwagon. Even CFA. They forecast that the property-casualty industry will continue making record profits – unless certain policy recommendations are taken. “Policy recommendations” sound like a lot of “change” to me. Enough with this “change” mumbo jumbo. Things need to stay just the way they are. 2007 was a very good year in the insurance biz and as long as no one mucks anything up 2008 will be even better. Pocketing premiums, dumping risk. This is working for us. Talk about a one-way ticket to easy street. Sure some may argue that they can't afford their skyrocketing premiums. Maybe these people are not meant to have insurance. Not everyone needs to drive a car. And yes, we’ve gotten some bad publicity for not paying claims to Katrina victims. Just because people paid for hurricane insurance doesn't mean we meant to pay for EVERY hurricane. What do they think, that we don’t need to make a profit? "It's not doctors versus lawyers," he said. "I know the proponents of the bill want to frame it that way. For me, it's about victims' rights." On Monday, the US Supreme Court allowed Michigan residents to continue with their case against the makers of the drug Rezulin. Although to be clear, this court decision does not change the restrictive drug industry immunity law in Michigan. In a story that sounds frighteningly similar to a story about a Long Island doctor, some 40,000 patients treated at the Endoscopy Center of Southern Nevada are being notified that unsafe practices like reusing needles may have exposed them to hepatitis strains and HIV. But, at least in this case Nevada has shut down the clinic (New York has allowed Dr. Finkelstein to continue practicing without even a day's suspension of his medical license). 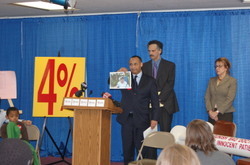 This morning, the “Patient Safety Express” made its way to Albany. 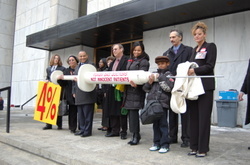 The 15-foot syringe and handful more medical malpractice survivors made it through the metal detectors at the State Capitol to tell their stories to the media. LuAnn Caruso was nearly in tears as she talked about her brother who went blind after a doctor ignored the recommendation that he have an MRI after he went to the emergency room with a terrible headache. Ruben Rodriguez clutched a photo of his 16-year-old son with hydrocephalus that was not properly diagnosed caused irreversible brain damage. Kim Bennett told the media of his years of pain after a neurosurgeon performed extensive and unnecessary surgeries on his neck. 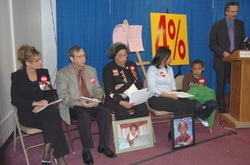 Jaden, an adorable spunky eight-year-old sat patiently during the press conference with his mother as his Grandmother told the story of his traumatic birth injuries, the subsequent surgeries and lifetime of physical therapy.